Yesterday was, all in all, a pretty good day. We (folks at the office) went to work, and I was even serenaded by someone with a morbid birthday song. It was so much fun. As the afternoon wound down, I was feeling pretty good, though exhausted from allergies. Then, what do I see? My brother walked into the office carrying this gigantic box he had wrapped with Christmas wrapping paper. I hadn’t expected to get any presents this year, so I was thrilled! What do I find inside? Yarn. 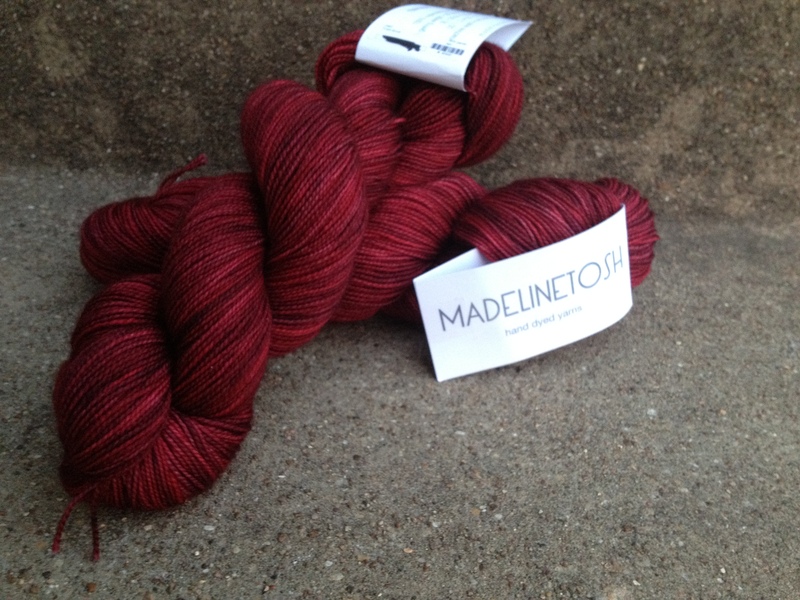 Brand new Madeline Tosh yarn in a beautiful Tart colour. Not only that, he had bought me 2 hanks. The possibilities are endless. I know where he got it because he asked me for the address for it last week. He went to MadTosh in Fort Worth. I’ve been wanting to go there since I heard about the new store at the DFW Fiber Fest. I don’t think he had too much trouble getting there. Luckily, he didn’t ask me for directions, just an address. I’m so terrible at giving directions. Anyway, it’s just off Camp Bowie up in Fort Worth, and he’d been up that way so many times when I went to college at TCU, so he should know the area by now. Anyway, I had intended to come home last night, make my friend watch Supernatural, and start a new project. With this new yarn, though, my original ideas have gone out the window. I want to make a shawl. I think a shawl in this ruby, Tart colour would be just lovely. I’d like to do a lace pattern as I’ve found I really enjoy lace knitting. I’m so excited! The evening turned out to be mostly hanging out, but I did manage to wind one of the hanks as my friend and I chatted away. Yes, I did even get her to watch 2 episodes of Supernatural, and I may have gotten her hooked. I picked 2 random, funny episodes in completely different seasons. It’s my bait and hook. Funny episode, then the viewer starts to get a little invested in the storyline. Too much fun! It’s how I got my husband addicted, too. No big weekend plans. I really want to see Men in Black 3 for my birthday weekend, so we may do that. Also, big big big event in our family tomorrow. My cousin is getting married! I’m so very excited for her, and I’m really kind of sad I can’t make the wedding. It’s on the other side of the country, and well, funds being what they are. Still, they’ve set up a video feed, so I’ll still get to see it. Do you have any plans for the Memorial Day weekend? Hey, just letting you know that I nominated you for the Versatile Blogger Award! Oh my. I’m knitting Colour Affection with Tosh Sock and it is like butter. If I could afford it (and it was practical), I would knit with nothing else. I can’t wait to see what you do with this!